Xiaomi’s Redmi series will become an independent brand on January 10th, much like Honor is to Huawei or Realme is to OPPO. The company is all set to introduce its first device with Redmi branding at an event in China tomorrow. We’ve already seen how the upcoming device is going to look like thanks to official images shared by Xiaomi’s executive. Now, just ahead of the release, the officials have shared another image of the upcoming Redmi smartphone. Xiaomi’s Global spokesperson Donovan Sang tweeted the latest teaser of the handset. It reiterated the Redmi phone will have a 48-megapixel AI dual camera setup. The phone is going to be only the third device – after Huawei Nova 4 and Honor View 20 (aka V20) – to sport a whopping 48-megapixel rear camera. Apart from the sensor – which the vendor has been bragging about for quite a few days – there isn’t much the image reveals. However, based on previous reports, the Redmi device is going to come in three hues – gradient Blue, Violet, and Black. Along with the vertically-aligned dual cameras, the handset is going to sport a rear-mounted fingerprint sensor at the back panel. The device has been rumoured to rock the mid-range Qualcomm Snapdragon 675 under the hood. And on the display front, it’s expected to sport a 6.3-inch FHD+ display. A beefy 4,000mAh battery is likely to fuel the device. 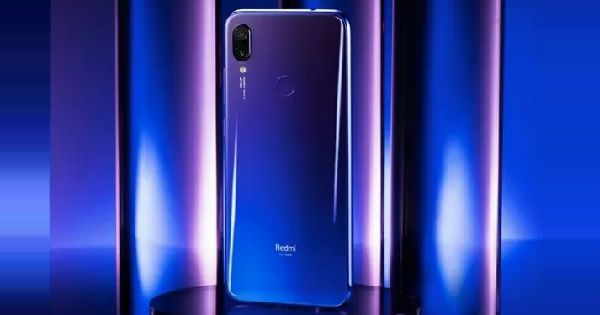 Other details such as the operating system, configuration, and front camera sensor are not known at the moment; however, these details will be revealed once Redmi will take the wraps off the device.